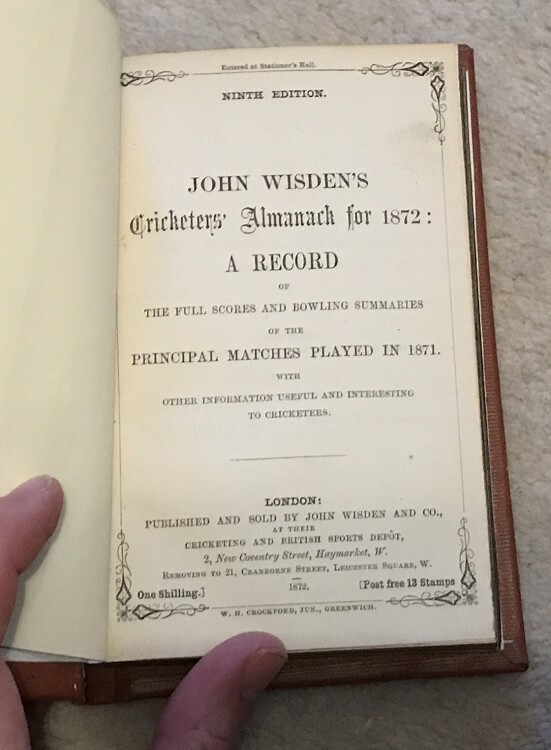 This lot is an 1872 Wisden , an original Wisden Rebound without the covers,. This rebind is in Very Good condition, the ninth edition of Wisden. The is bound in red boards with gilt to the spine, the pages are nice and clean, there is some darkness to the pageblock but other than that it is very nice, minimal trimming but no lack of text, extra blank pages inserted by the binder. A very nice book. Payment: Cheque or BACS only please, contact me if you prefer another method. Postage: £8 which covers special delivery fully insured & Jiffy Bag please contact us if form outside the UK so we can arrange insurance.